Mirroring360 offers features and tools to facilitate large-deployments by schools and corporations. If the device and the computers (often connected to projectors or whiteboards) are on separate subnets or VLAN’s, the device’s auto discovery cannot find the target computers. On a single subnet, if there are many mirroring receivers, the device’s auto discovery process can be very long and slow to populate the mirroring receiver list. With Mirroring360, users can connect the device to the target computer by identifying the computer directly via either a QR code or a Meeting ID. Using direct identification the device and the computer do not have to be on the same subnet. As long as they are routable, they can be connected via either a quick QR code scan or specifying a Meeting ID. 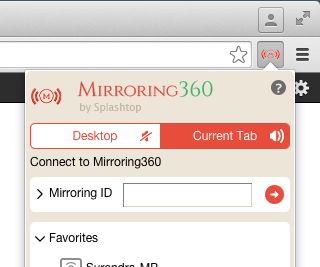 Mirroring360 also provides the ability to disable Bonjour and Chrome broadcast, so that it does not jam up the network and the user can use Mirroring Assist to only see the computer he/she wishes to mirror to (instead of a long mirroring receiver list). Ensure Mirroring360 is running on your Windows or Mac computer. You should see it in your system tray. On the “General” tab, click on the “Mirroring Assist” button. The QR code window should pop up and the Mirroring ID underneath it. 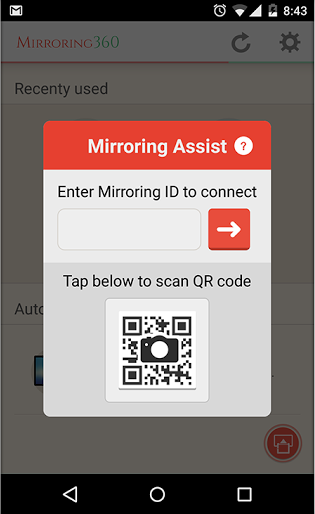 Download the Mirroring Assist app onto your device. Search “mirroring” in the App Store, or click here if you are using an iOS device. Launch the app, scroll down to the “Help me Connect Now” section, and click the “Connect with Mirroring Assist” button. Follow the directions provided and scan the QR code on your computer or just type in the Mirroring ID. Go to your Airplay list and you should see the computer name. Click on it, and also scroll down to turn on the “Mirroring” option right below the computer name. Download and install Mirroring Assist for Mac. Click the Mirroring Assist icon on the menu bar. 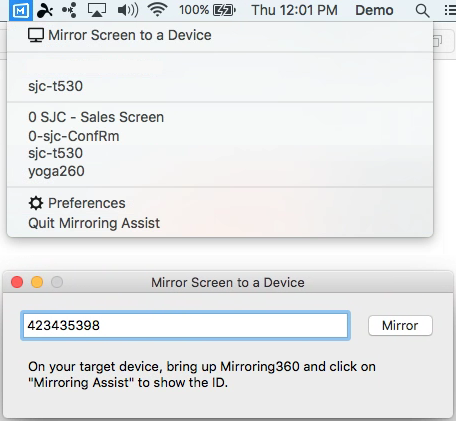 Click “Mirror Screen to Device” and enter Mirroring ID of the computer you want to mirror to in the box. Then click the “Mirror” button to start mirroring. Download Mirroring360 Sender app from the Google Play Store. Launch the app and tap on the lower right hand corner to launch Mirroring Assist. Enter the Mirroring ID or scan the QR code on your computer. Don’t have Mirroring360 yet? Get it now! Mirroring360 is available as an .msi package for easy deployment and configuration (with Microsoft Group Policy and AD). For example, the IT administrator can pre-configure the license key, proxy settings, Bonjour broadcast, EULA, resolution settings and more. The IT administrator can make it very easy for the end users to use it without worrying about any setup / configurations. Please contact sales@splashtop.com for detailed instructions and documentation. For organizations and schools / districts requiring hundreds or thousands of licenses, we can offer a single license key to activate all of the devices. When used in conjunction with the .msi configuration options, the IT team manages it all without putting any burden on the users. For organizations and schools / districts requiring hundreds or thousands of computers, we provide the ability to turn off Bonjour discovery / broadcast. Bring up the Mirroring360 app on your computer, click on the “Advanced” tab, and you can find the setting that allows for disabling Bonjour discovery. You will need to use Mirroring Assist to connect if you select to disable Bonjour.